Successfully Added Headphone Beanie to your Shopping Cart. 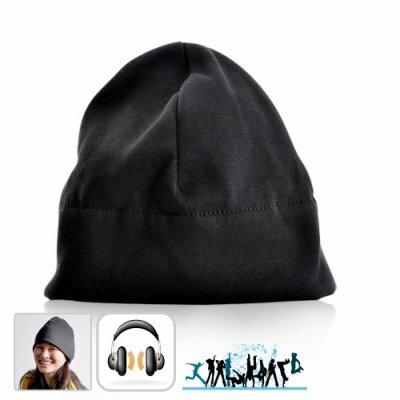 Keep your head warm and enjoy great music at the same time with Headphone Beanie from Chinavasion. This new stylish headphone beanie is made from 100% pure thermal cotton for warmth while two high quality stereo earphones are comfortably integrated inside. Anyone who loves music will appreciate this great stylish Headphone Beanie that provides total comfort while you play your favorite tunes on your way to work or during your sports activities such as: biking, jogging, skateboarding, snowboarding, skiing, etc. It can be linked to any device with a 3.5 mm audio output, which includes such tech gadgets as the iPhone, iPad, iPod, cell phones, mp3 and mp4 players, Sony PSP, Nintendo DSi, Dingoo A330, and many more. The Headphone beanie is very comfortable to wear and well insulated to keep your head and ears warm. The earphones are hidden within the inner layer of the beanie, and can be easily adjusted to fit your ears or removed for washing. Leave your old style headphones at home and grab this Headphone Beanie on your next trip out! With our superb factory direct wholesale price and other similar headphone hats/beanies sell for at least double our price, there is so much room for profit for you. So don't wait, hurry and get your samples in right now before our stock sells out. Brought to you by the leader of wholesale electronics - Chinavasion. Can I wash the Headphone Beanie? Yes, but make sure you remove the speakers first before washing. Can I use this with my iPod and PSP? Why should I by the headphone beanie over a normal headphone? Firstly wearing a hat with headphones is a near impossibility, and ear buds are very uncomfortable over a long period of time.